The first thing clients and potential customers see when they walk in the building is the reception area. This is your opportunity is to make an amazing first impression. GA shows how you can use Aluminium Desk Fascias to make your business reception area shine! 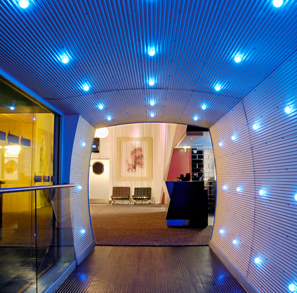 You can carefully design your reception area to be functional, professional and stylish. Various design elements such as colour, materials, layout and branding can make a statement about the culture and values of your company. Ensure that your reception area creates the perfect impression by taking the time to thoroughly plan each detail of this important aspect of your office space. When it comes to appearances, aluminium can certainly be finished in style with a number of different effects. Also, depending on the application, aluminium is often used in its natural state. For many uses aluminium looks great in mill or anodised finish. There are occasions however when a colourful alternative may be required and that’s where GA’s ‘Spectra Bond’ powder coating (available in RAL colours) comes into its own. Anodised aluminium provides an attractive matt metallic easy to maintain effect that will normally last for many years. The anodic film is extremely durable, corrosion resistant and light-fast. The anodising process interacts with the surface of the aluminium. For this reason it is important that a suitable aluminium alloy is selected, together with the surface finish being in good condition. 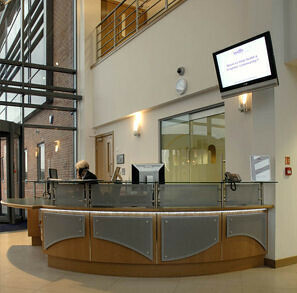 For inspiration check out our reception desk fascias area. RD5 Panels with GA Posi-Grip Instant Access Framing and Spacers. Made to Measure Panels. 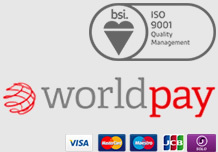 It’s so easy, provide the checklist information and we’ll deliver to site ready for fixing. Here at Gooding Aluminium we know our acute angles from our perforated sheet, we thought it would be really helpful to our customers, to give a concise definition of all things aluminium. So please read our GA Glossary of Terms and let us know what you think! Have we missed anything? If so, do tell us by leaving your comments below!